Composer, guitarist and above all a talented musical alchemist, he was instrumental in shaping the sound of Dominique A, Laetitia Shériff, and was invaluable to the much esteemed Bed. Hovering between hip-hop excursions (Psykick Lyrikah), solitary escapades (La Chair des Anges, and the recent MellaNoisEscape) and limitless acts (Mobiil) or movie-concerts, Olivier Mellano is often spotted where least expected. Now, he is back with How We Tried…, a creation out of blinkers, a trilogy mixing acoustic, electric and electro/hip-hop music, voices, sounds and projected images. Olivier Mellano presents this new work in three interpretations of the same musical theme, divided into four movements inviting us to a ‘metaphorical journey’, a one way ticket to discover the ‘act of creation’. Romanticism grew out of a sense of loss: loss of primal speech, of harmony between the self and the cosmos, of the key to explaining the world, and even of the rituals that authenticate our relationship to the divine. The poet entering this new world encounters all the problems tied to this initial loss. Everything becomes terribly mysterious. We are divinities at birth, but are abandoned; we are chosen but unconnected. We are held at a distance and our thirst cannot be quenched. Will we ever rediscover the path of transfiguration that will once more enable us to become the emissaries of a conscious and creative divinity? Our entire lives are devoted to the search for a polestar, for the ‘blue flower’ that unites the self with the All, for the little voice that tells us what to do. Our works of art no longer represent the serene knowledge that precedes us and comprehends us. They must now produce – while also producing themselves – their raison d’être, their theory, their analysis. They are immediately cosmic: they must be conceived as poetic art, as a natural system. But this natural system is unfinished, broken into fragments, like a piece of porcelain that breaks in the sitting room. And we run about like little rabbits whose paws have been broken in hunters’ traps. Olivier Mellano knows all this. How We Tried a New Combination of Notes to Show the Invisible or Even the Embrace of Eternity is a piece that reaches for the absolute. The absolute in music is the point at which music engenders itself, when the composer merely acts as a filter through which the music enters and exits like an endless stream of black coffee. The quest for this state of grace is the musician’s ‘blue flower’. It is the reason he endlessly searches and suffers. The musician’s desire is to find the point at which he completely gives himself up to the pressure of the music itself, becoming its humble and anonymous executor. How We Tried… is also a work that makes its own commentary on itself. The voice constantly sings about what the music is in the process of doing; the voice serves as the ongoing conscience of the search, the doppelganger of the process of emerging. The voice is both a rejoinder and part of the unfolding process of doubling, the embodiment of its impossible termination. ‘This music is going nowhere. Our hearts are heavy, too. We too have been alone for a small eternity, since the ‘little voice’ in our heads – our Angel or celestial twin – has stopped telling us clearly which path to take. Olivier Mellano steers his composition like a Mallarmé captain aboard his ship. After finding his first note with a throw of the dice, he pitches and zigzags on a sea of sound and notes. ‘Everyone plays the lowest note. ‘In ancient times when only gods occupied the universe, a goddess was sent to the earth as punishment. Embodied, fallen from the ether, desperate and fighting the elements, the goddess brought from the depths of her being a memory of the ether, and projected it with the full force of her throat over all the things of the earth. The air began to vibrate and the first music of the earth was heard. There are several ways to spin around the Great Note. One is ceaseless repetition. Another is the technique used by romantic poets: withdrawing as far as possible and carrying out one’s search in a baroque, ironic, rhapsodic way, in order to let the Great Note appear in the heart of one’s constructions, like a spectral, polychrome presence. Our relationship to the All can be expressed in a brief, decisive poem, but also in romantic constructions of extraordinary complexity filled with labyrinthine passages and secondary characters, each of them epiphany-like reflections on the lost Oneness. Dostoyevsky’s notion of divine harmony, of total accord between human beings and the sound of the Great Note, perhaps came from the tradition of hesychasm, or perhaps from his epileptic fits. This can be sensed in the feelings expressed by Kirilov near the end of Demons, which Olivier Mellano used in How We Tried…: ‘There are certain seconds when you feel the presence of a universal harmony, which you have completely attained. There is nothing terrestrial about it. The feeling is clear and unmistakable. It is as if you can feel all of nature and you say: yes, this is right. It is not emotion, it is joy. Oh, it is a higher feeling than love. Olivier Mellano evokes universal harmony through successive associations and dissociations, through breaks, reiteration, cuts and reprises. These express the heartrending experiences of the soul in search of deliverance. His work is constructed like a Tower of Babel whose sole purpose is to be destroyed, to be struck by the thunderbolts of divinity and to preserve their resonance in its imprint. Note by note he builds up his gigantic symphonic work like eggs being beat into a meringue. But at the last moment, in one brief gesture, he allows it all to fall to the ground. And he begins the creative process once again in versions that both approach and withdraw from this intuition. This enables us – the listeners – to reassemble, one piece at a time, his cosmic puzzle. We can also take a few fragments away with us to create a new puzzle or a new cosmos. These fragments are living, and they speak to us. Listen to them: they will not cease to haunt you. You are the lucky owner of the box ‘How we tried a new combination of notes to show the invisible‘ ? Get the alternative versions by using the code you will find at the end of the libretto. Olivier Mellano, a titan in his work. Musical science fiction, an unusual project that propels us towards new imaginations, (…), a powerful work. An ambitious, titanic (…), gorgeous symphony, How we tried… turns out to be as complex as consistent, as exhaustive as fascinating. If we think this passionate record will not shade the mash music at the top of the charts, we can bet it will leave a mark on its author’s discography and on the story of music full stop. A demanding and atypical artistic quest. 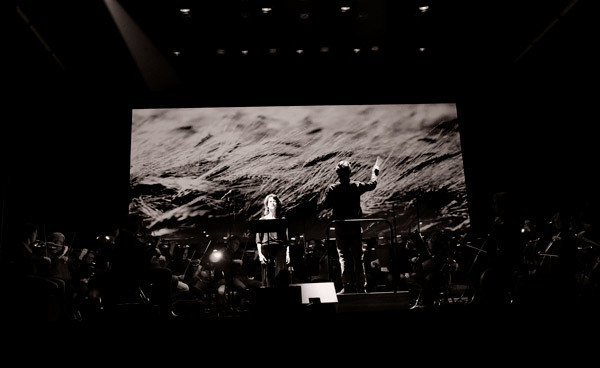 Composition science, virtuoso manipulation of musical forms, epic breath of long term operas : How We Tried… impresses – do not miss the performances organized here and there. Difficult to know who could take it all in and give every part its due but in its sprawling, almost unnavigable ambition, as with that of Les Transmusicales in general, I salute it. 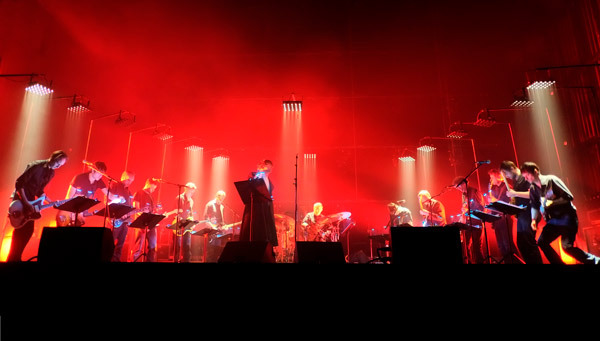 This brillant show has been the most important event of Les Transmusicales 5 day Festival. Ambitious, pioneering and thus exciting! This year, the surprising, fascinating and demanding creation (of the Transmusicales] was at the Rennes Opera house with Olivier Mellano. If this creation can disconcert the one who dislike non-standard creations, the result is actually transcending.